Although I love warm and sunny days, I'll be the first to admit it's exciting when summer begins to dwindle away. When I was a kid, the songs of cicadas at dusk always signified that I was heading back to school, and that the leaves would soon fall through crisp, autumn air. There was something magical about the upcoming fall season. Even as an adult, the end of summer still holds plenty of charm and potential for outdoor fun - just think about Labor Day weekend and the start of football season. 1.) Repurpose a cardboard egg carton by filling each egg cup with one briquette of match light charcoal. Place the egg carton in your barbeque grill or fire pit and light it with a match for a quick and convenient fire starter. This tip comes in handy for camping trips, too. 2.) Instead of buying bags of ice for your cooler, fill and freeze a colorful assortment of water balloons for a whimsical alternative. After they melt, the water is contained inside the balloon and makes for a mess-free cleanup (or a potential water balloon fight to celebrate the last bit of summer). 3.) 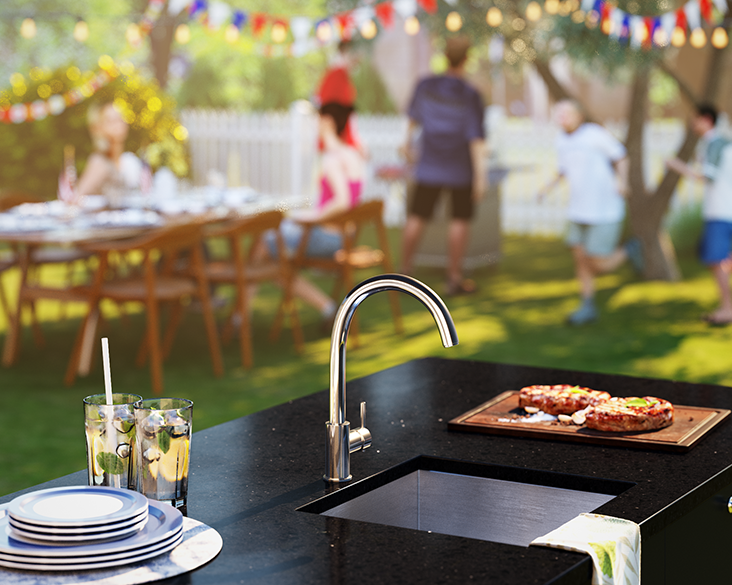 If the cooler is full and you need extra space to keep drinks cool, an outdoor bar sink can be filled with ice and drinks, too. 4.) Skip the harsh chemicals in foul-smelling insect repellants and DIY your own using natural ingredients. For example, try citronella, lemongrass, eucalyptus, tea tree, and lavender essential oils (10 drops each) mixed with one part witch hazel and one part distilled water. This recipe creates a fragrant mixture you can pour into a spray bottle. Or you can get creative and pour it in a decorative glass jar and top it with a floating candle. 5.) Keep pesky bugs out of your drink by flipping a cupcake liner upside down over your glass. Poke a straw through the liner for a makeshift "lid." 6.) Use a 6-pack bottle carrier to hold utensils or your favorite bottles of sauces. 7.) Repurpose a muffin tin as a condiment caddy. Fill each compartment with toppings and condiments. Include mini serving spoons or large, labeled popsicle sticks for each condiment so your guests can easily customize their burgers and hot dogs. 8.) Fitted twin-sized sheets fit snugly over tables and won't blow away in the wind like plastic tablecloths.